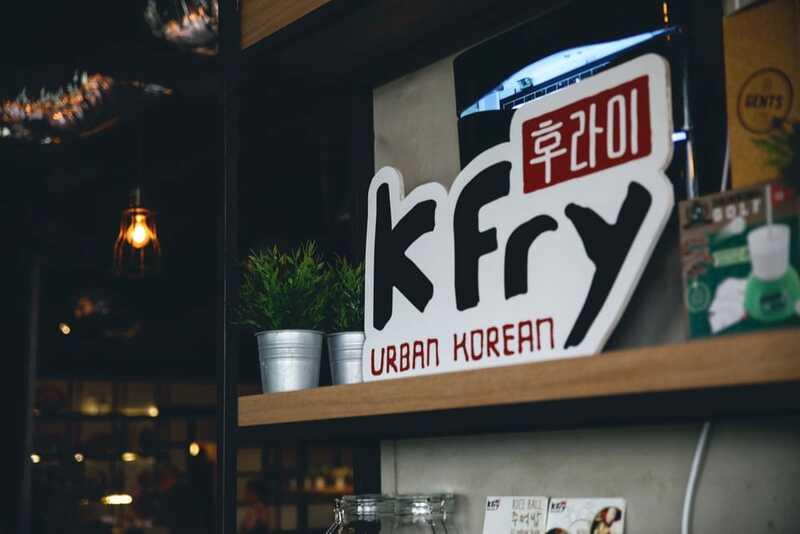 Here at Holiday Villa, a hotel located just next to KSL City, rises a brand new Korean restaurant exclusive to Malaysia – K FRY Urban Korean. 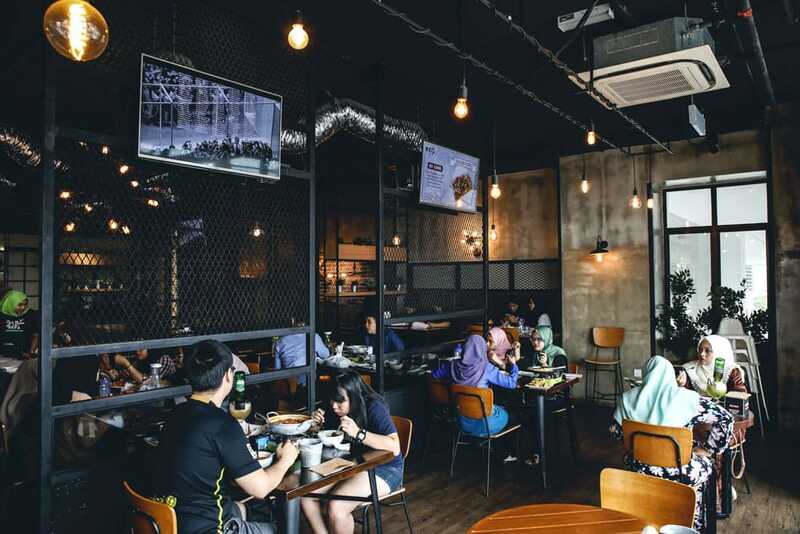 Bent on creating a Korean restaurant friendly towards Muslims, this 100% Malaysian-owned restaurant had set out on a quest – to ensure that every single item on their menu is halal. Today, they have managed to do just that, and are currently processing their Halal certification as we speak. 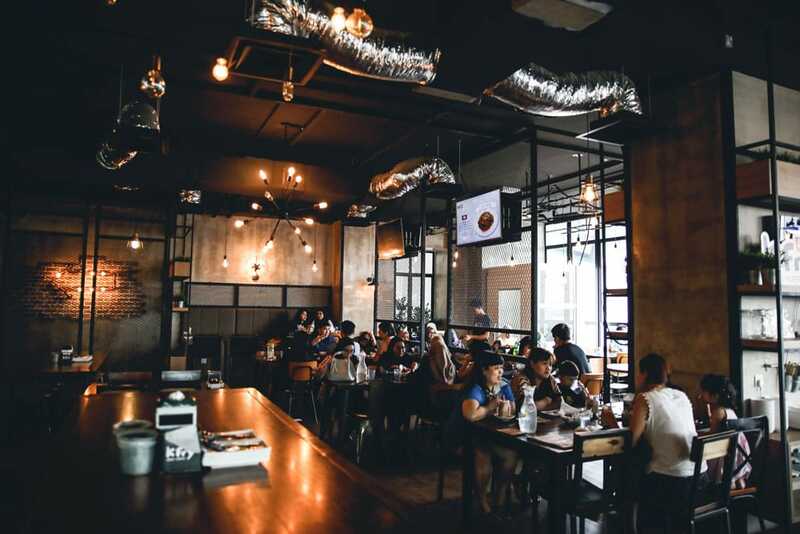 Judging from the amount of Muslim diners we saw during the lunchtime peak hour, it certainly was the right decision for them. 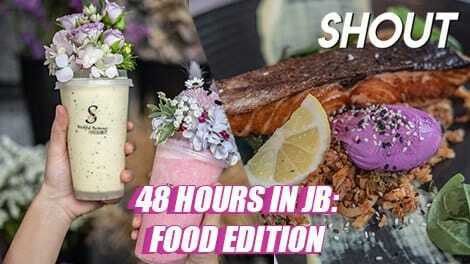 Once you’ve laid eyes on their irresistibly gooey, cheesy fried chicken, you’d soon find yourself booking the earliest train ticket to JB just for a taste. 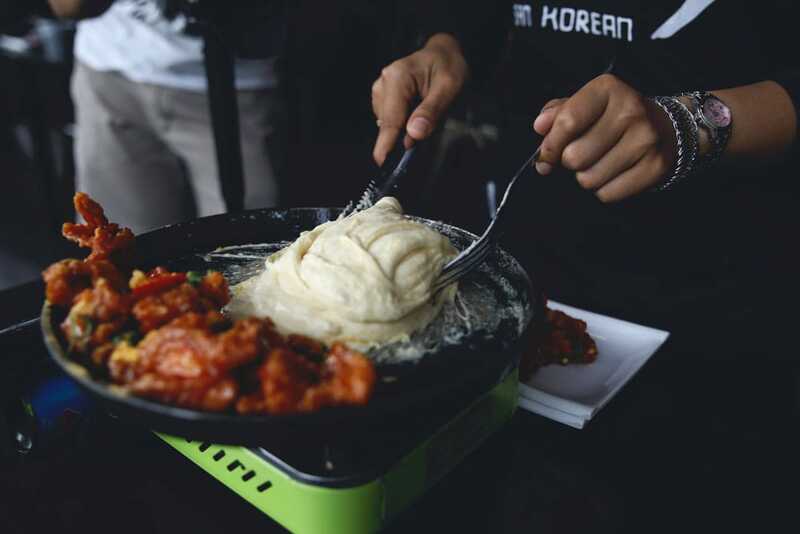 But if you’re just craving for some good and honesg Korean cuisine, K FRY also offers the more traditional grub such as Oma’s Ginseng Chicken (RM38.90/~12.70SGD), Budae Jigae or Army Stew (RM38.90/~12.70SGD), a variety of Korean ramyeon, as well as some Jumeokbap (Rice balls). 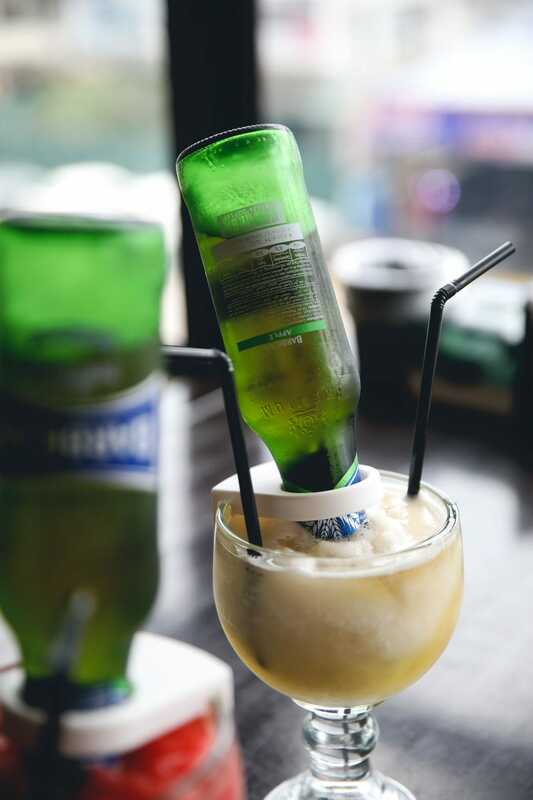 A rather eye-catching beverage sat on almost every table, piquing our interest – what was this strange drink that incorporated an overturned glass bottle within a goblet? It looked suspiciously like an alcoholic drink, but as emphasised in its name, this drink was an X’Tra Virgin K’ocktail, completely free of alcohol. What looked like a beer bottle was actually an apple-flavoured malt beverage, inverted over an ice blend. 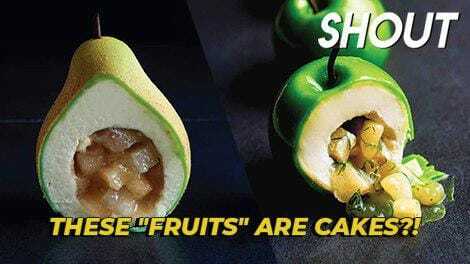 Different fruity renditions were available, examples being the Ocean Rita – a cerulean, citrusy rendition – as well as the Mango Rita, Apple Rita, and Peach Rita. 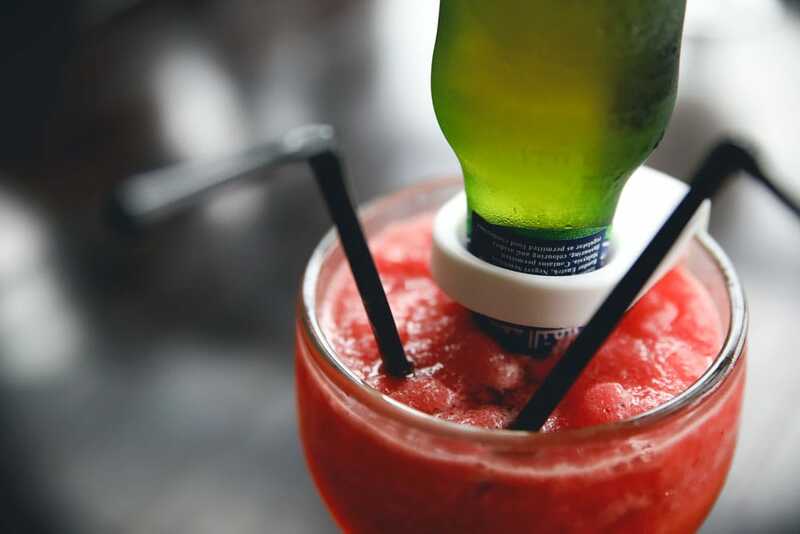 We went for the Lychee Rita and Strawberry Rita, and soon learnt that a slight difference in the angle of the bottle may lead to a significant difference in taste, as too much of the malt beverage may rush into the glass and risk overpowering the drink’s original flavour. This was the case for the Lychee Rita, however, the lychee flavour had been robust enough to slice through the taste of apple, making for a fragrant concoction with some fizz. 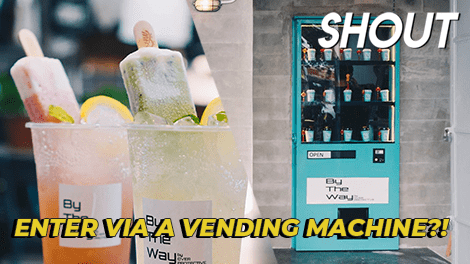 As interesting as it is, we’d suggest setting aside these drinks for a sweet tooth, as the mixture of liquid may prove too sweet for the average person. But if you do want to try this drink, you might want to share one with a friend, as a glass may be too much for one. 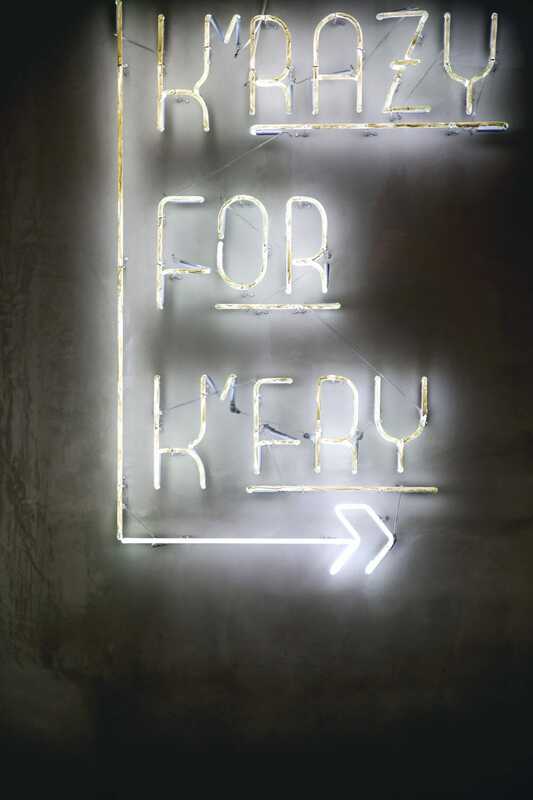 If you’d like something richer, K FRY also offers K FRY O’Shakes (RM15.90/~5.30SGD), a small range of over-the-top milkshakes such as the chocolatey Nutella Madness and Kookies Madness or fruity Berried Under and Five Cs. 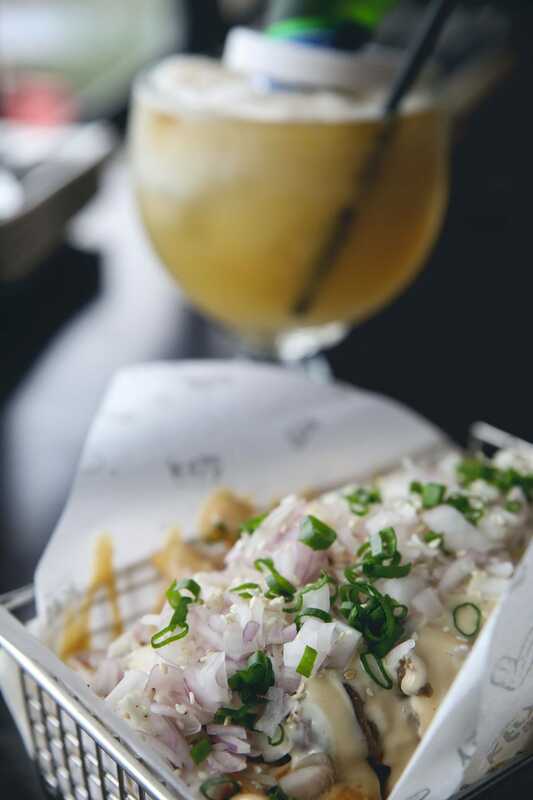 We decided to start off with some fries, and opted for one of their recommendations – the Beef Bulgogi Fries. Dak Bulgogi Fries, the chicken rendition, is available as well, priced slightly cheaper at RM22.90/~7.60SGD. The price was appropriate for a serving of loaded fries. 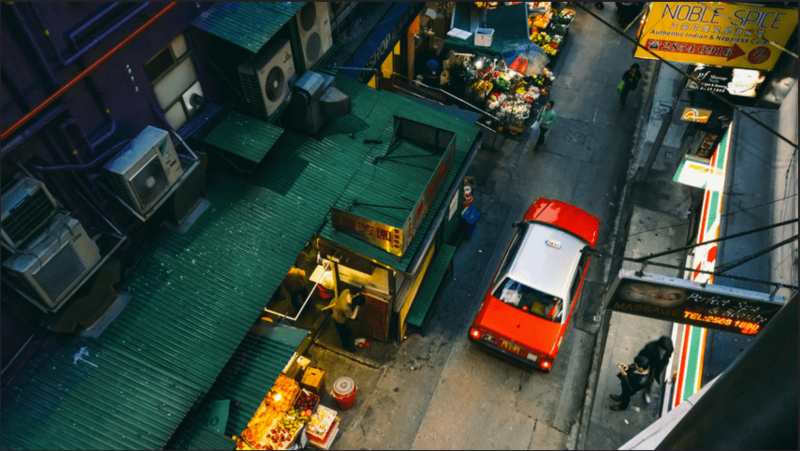 But what arrived soared above our expectations – a single order could easily feed 3. 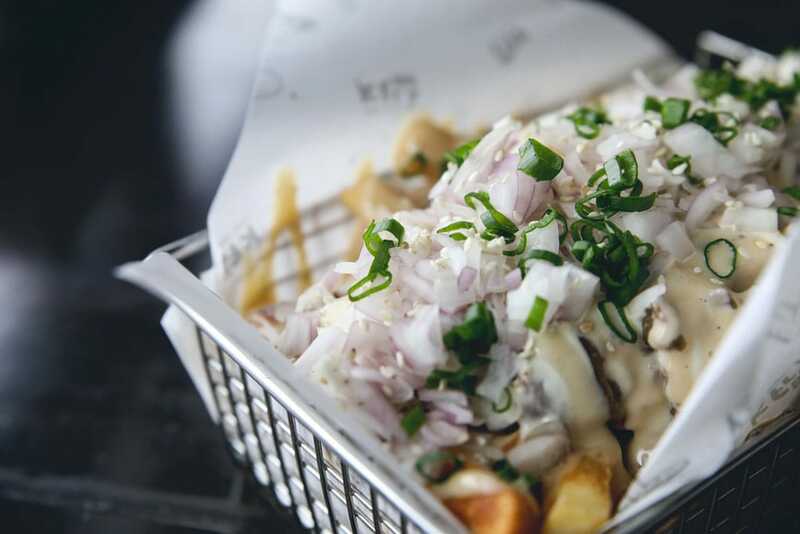 The thick-cut fries were doused in a cheese and mayonnaise mixture, blanketed by a layer of beef bulgogi and topped with an abundance of chopped onions. Make sure you get every single component on your fork. 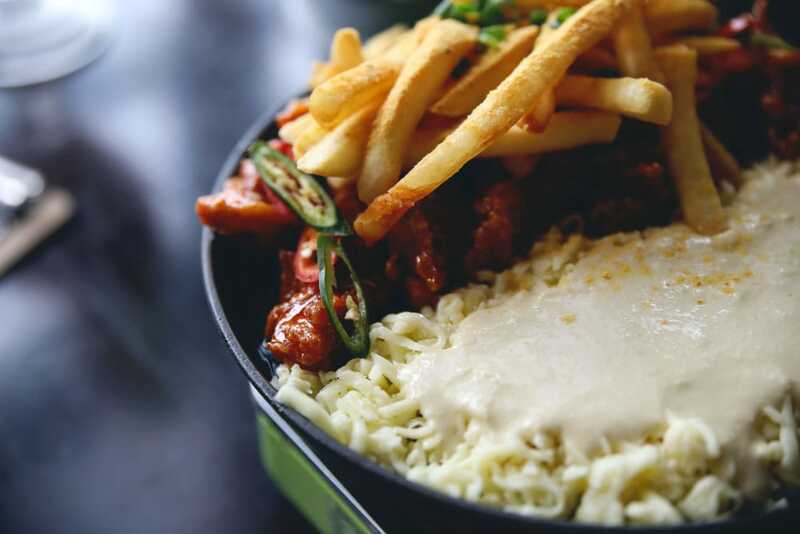 The sauce was reminiscent of everybody’s favourite cheese fries from KFC – but add a serving of beef, and the taste has already improved tenfold. Don’t be alarmed by the overwhelming amount of onions covering the dish, and please don’t scrape off the pieces stuck to the fry on your fork. 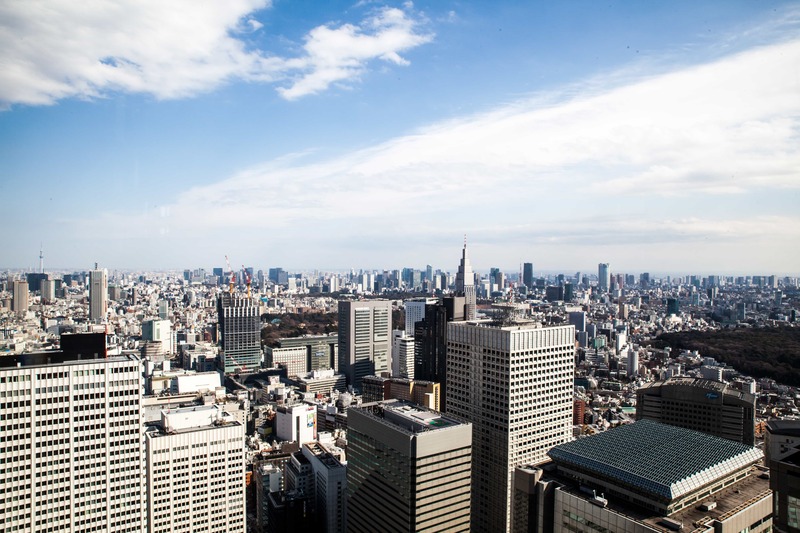 Give the combination a chance if you aren’t a fan, and you may be in for a surprise. 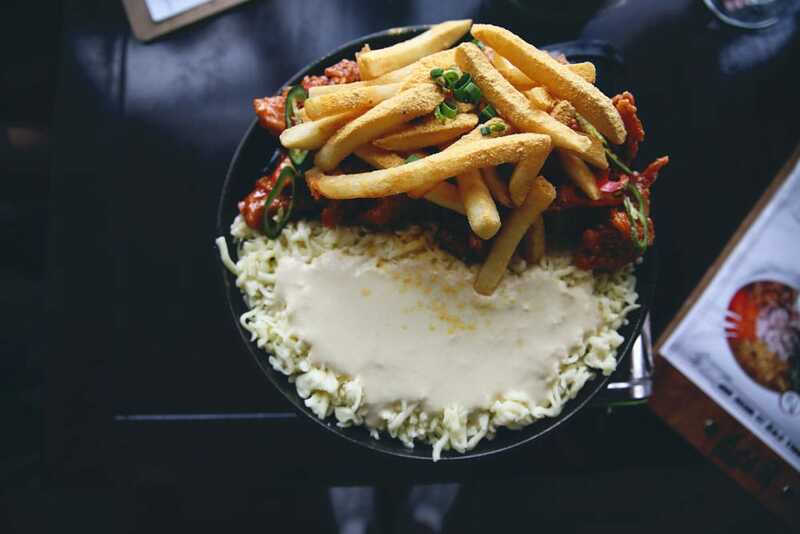 The slight crisp of the onions added on to the array of textures already present in the dish, and its spicy bite ensured that the fries don’t get too cloying in its creamy dressing. Besides fries, more traditional side-dishes are available as well. You may opt for the Seafood and Green Onion Pancake (RM26.90/~9SGD), a staple for any Korean meal. If you’re looking for something heartier, do try the Tteokbokki with Cheese and Seafood (RM28.90/~9.60SGD), which comprises of rice cakes, fish cakes, mussels, and other seafood doused in gochujang, a Korean red chilli paste. 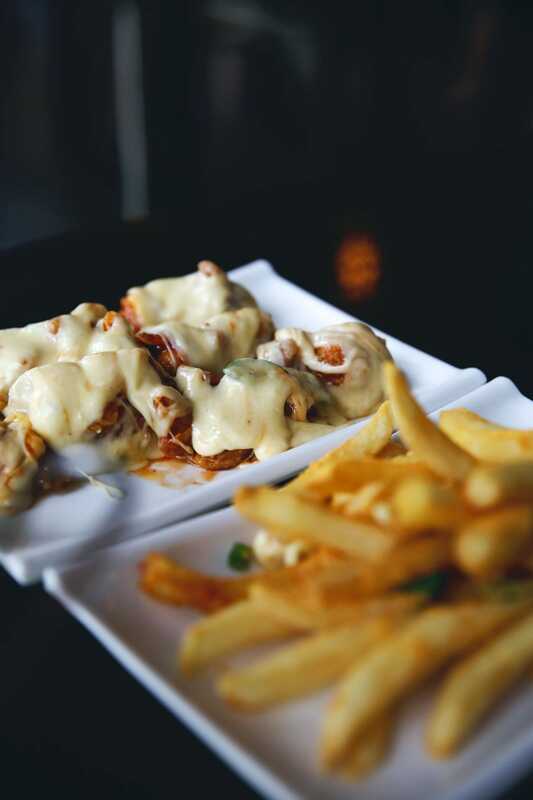 When the staff finally brings the hot plate containing a mixture of unmelted mozzarella cheese and cheese sauce, fried chicken, and fries, it’s time to whip out your cameras. Sit tight for a couple minutes of theatrical cheese melting, and be prepared to tilt your camera a good 180 degrees for the intense cheese pull. Who knew melted cheese could be so pillowy? After you’re done getting goosebumps from watching the staff wrap the fried chicken with a substantial coating of gooey cheese, it’s time to get one of these golden bites into your mouth, stat. 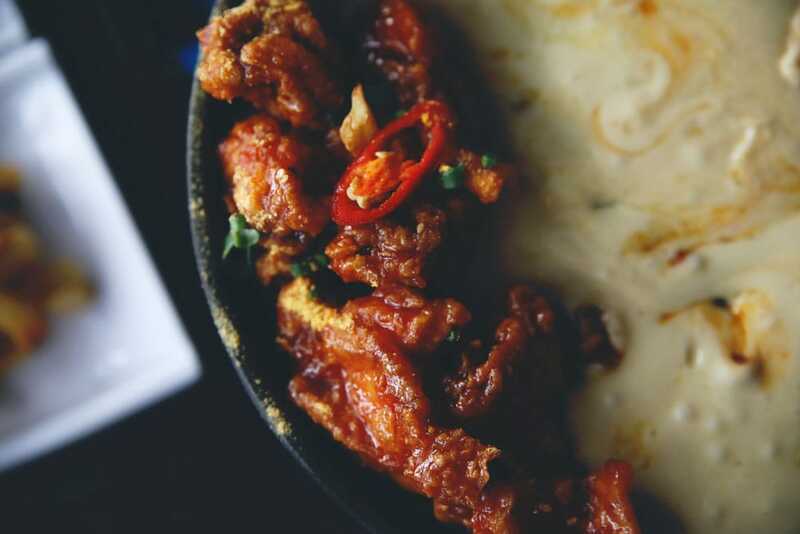 Let your teeth sink through the cushiony cheese layers before finally meeting the crispy exterior of the fried chicken, where you’d get a hit of the spicy yangnyeom sauce. Even with the thick layer of cheese, it didn’t get cloying at all, likely due to the counteracting effects of the spice. 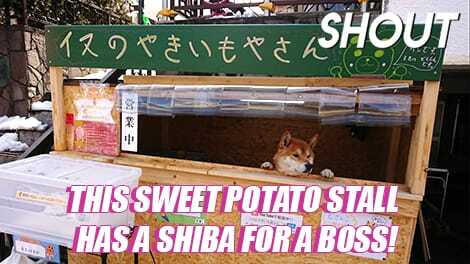 Of course, if you’re the kind able to handle spice, this flavour would be right up your alley. The spice of the sauce was still able to cut through the milkiness of the cheese, making it satisfyingly hot and so delicious. 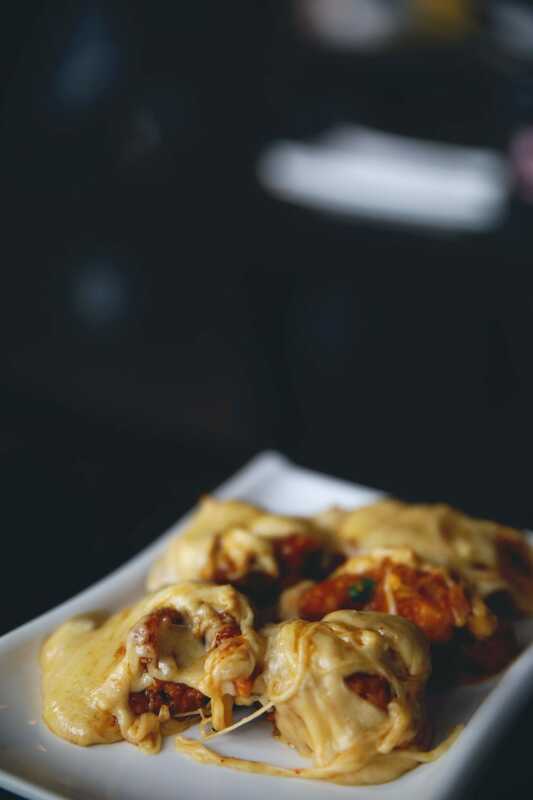 If you really can’t take spice, K FRY also offers non-spicy variants of K FRY Chicken Bumbuk such as the Original Cheesy Fried Chicken Bumbuk and Honey Mustard Cheesy Fried Chicken Bumbuk at RM48.90/~16.60SGD). A selection of classic, non-cheesy Korean fried chicken is offered as well, coming in flavours such as Garlic Soya (28.90RM/~9.60SGD) and even Honey Butter (28.90RM/~9.60SGD). Dessert came in the form of the classic Korean bingsoo available in two sizes here – large or mini. K FRY’s Mini Bingsoo Series comprises of premium flavours such as Strawberry Cheesecake (RM28.90/~9.60SGD), Matcha Green Tea (RM18.90/~6.30SGD), and Oreo Chocolate (RM18.90/~6.30SGD), whereas the larger bingsoos include the Mango Bingsoo (RM28/~9.30SGD), Watermelon Bingsoo (RM28/~9.30SGD), and Melon Bingsoo (RM38/~12.70SGD). If the value-for-money wasn’t enough to convince us, the aesthetic of perfectly spherical melon balls in the picture definitely took us in. 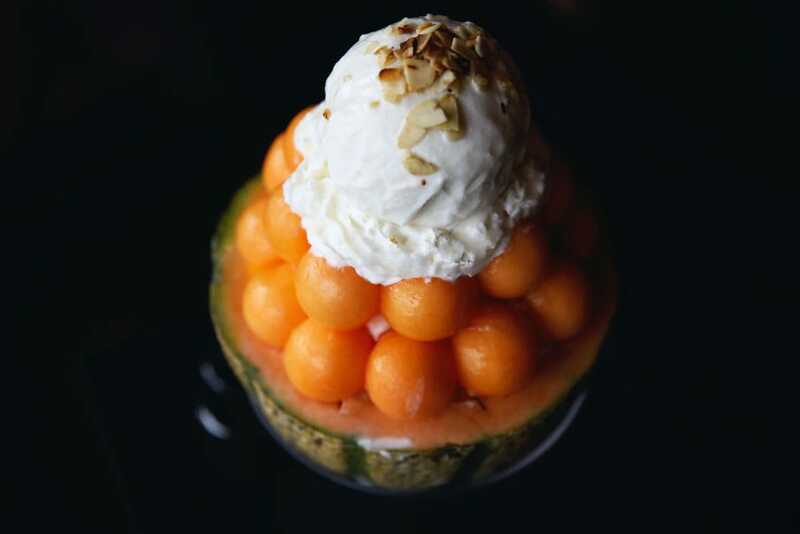 Unable to resist the temptation of getting bingsoo to finish our meal, we went for the prettiest of the lot – the Melon Bingsoo. 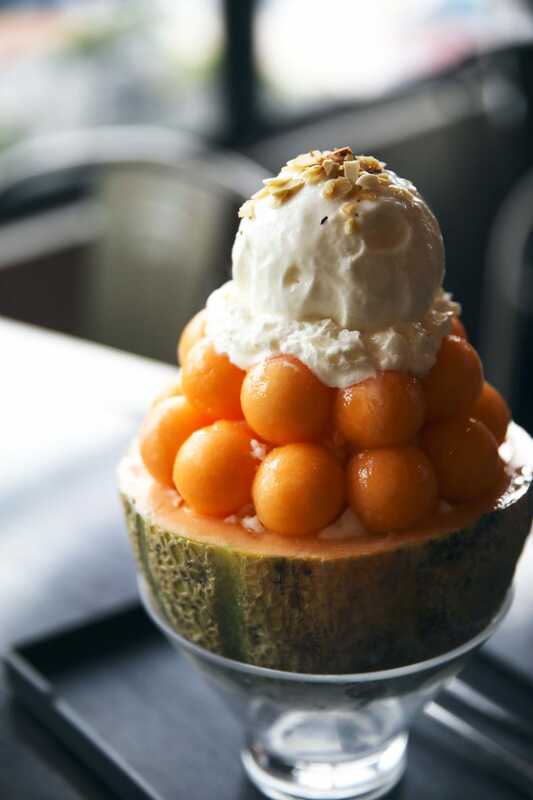 Our Melon Bingsoo arrived served in a melon half, topped with a scoop of vanilla ice-cream. Unlike most bingsoo, this one did not come served with a tub of sweetened condensed milk – a condiment you’d consider a game-changer. But once you’ve hit ice and gotten a taste of it, you’d realise there was no need for it. The shaved ice was not ‘dry’ like most bingsoo usually is, but already had the creamy texture you’d get when milk is poured in. This made for an easier experience, less the carefully spaced pouring of milk and intense mixing you’d usually have to do for bingsoo. But after the fiery experience that was Korean fried chicken, the iciness of the bingsoo was the perfect soothing solution, as well as a delightfully saccharine resolution to our satisfactory meal.